Was Joey Votto the reason for the creation of the What I Love About series? Maybe. Maybe not. Maybe I’m not ready to delve into that part of my psyche, so back off. What’s for sure is that I’ve put off writing it, always feeling like I was too tired, my time was too tight, or I wasn’t feeling eloquent enough to do justice to the awesomeness that is Joey Votto. Suddenly, we are post All-Star voting and in the unthinkable scenario of the league’s best first basemen omitted. Like many people, the fact that this is even possible makes me throw up my hands at the joke that the All-Star game has become–maybe has always been–and if it were just about me, I would turn my back on the whole charade, shake my head at the obvious meaninglessness of it and try to get on with my day. However, it’s not just about me or even about all the fans (ironically enough), but it’s also about Joey Votto. Guys, this team has sucked hard for friggin’ decade. This is our chance to express our gratitude to the man who has played such an important role in changing that and who has been, up till now, ignored. This guy doesn’t deserve to be left behind just because MLB found it necessary to pimp Albert Pujols and Charlie Manuel felt the need to practice nepotism. Which gets to the heart of why I love Joey Votto. Because no matter what goes on around him in the league or on the field, he’s going to keep on being awesome. If the world is too blind to see that for themselves, well then we’ll just tell them. Balloting began immediately following Sunday’s Major League All-Star Selection Show and continues until 4 p.m. ET on Thursday, July 8. The winners will be announced on MLB.com shortly thereafter. Mobile voting in the U.S. is exclusive to Sprint, Nextel, and Boost subscribers. To receive the 2010 All-Star Game Final Vote Sponsored by Sprint mobile ballot, text the word “VOTE” to 1122. To vote for a specific player, simply text message your choice to 1122. EXAMPLE: Text “A3″ to vote for AL Player 3 or “N3″ to vote for NL Player 3. Messaging and Data Rates May Apply. Mobile voting in Canada is open to all carriers; fans should text their choices to 88555. Std rates may apply. 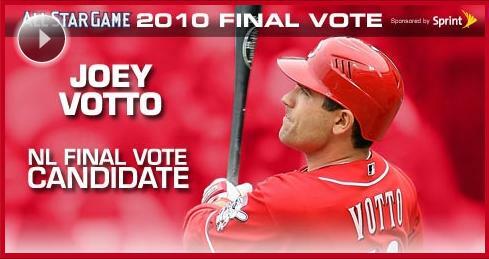 Posted in Cincinnati Reds, Human League, Joey Votto, NL Central, Vote Votto.